Upgrade your game with Hela Disc, the first flying disc that changes shape during flight to fly faster and farther. The original flying discs were actually Frisbie Brand pie tins. College students found they could toss the tins long distances (which presumably encouraged more pie eating). Since then flying discs haven't seen much innovation. Cut to Bill Cowles and Will DiMotta, who engineered a disc that breaks the traditional mold. The Hela Disc uses FlexFoil technology, which lets the disc shift its shape and lift mid-flight. An oval with weight focused on the two ends, the disc’s natural centripetal force makes it compress and fly true, even in high winds. With these ingenious advances, the Hela Disc launches an old favorite into the modern age. I’m Will the co-creator of Hela Disc, the world's most advanced throwing disc. We’re excited to partner with Grommet! We look forward to any questions. Hi! 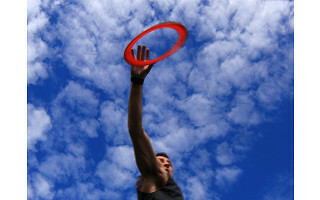 I love the idea of the Hela Disc, my brother plays ultimate Frisbee and I would love to get him one for Christmas. Do you ever see discs like this becoming popular for ultimate? @Kirstin, we would love to get the Hela integrated into ultimate, most leagues are very strict regarding what discs they are allowed to use. We are also in the process of developing our own game! Thanks for the question and excitement about the disc! I'm an Ultimate player myself, and was one of the testers of the Hela Disc here at The Grommet. I took it to a game with me recently and threw it with some of my teammates. The Hela Disc flew far and fast with minimal effort (even in wind) and the shape made for some fun catches. While I don't anticipate it becoming popular for competitive Ultimate just yet because of the sport's current regulations and the newness of this technology, I can definitely see this being a fun alternative for pickup, or just throwing with friends. @Aly, agreed ultimate is very protective of their disc. how does this differ from the Aerobie? Hi Jim, Kristan here from The Grommet. We are happy the Hela Disc has caught your eye and want to make sure you receive the most accurate answer. Will or someone from The Grommet team will be here to answer your question shortly. Thanks for your patience. Aerobie it actually has directions how to bend the airfoil back into shape. Short for flexible airfoil, "FlexFoil" is what we're calling the technology behind the next generation of flying discs. The Hela is the first throwing disc engineered to change shape during flight. Look at the Hela from the side view and notice the curve. When placed on a table, the Hela should rest on the two ends with a raised arch in the middle. Press down evenly on the arches and see the Hela flattens. Ok, same principle when thrown, except the two heavier ends act as weights, pulling the disc flatter from the extreme ends (centrifugal force) as the disc spins. Mid to high level players experience Hela's unique ability to speed up during flight. Unlike any other throwing disc. This increase in speed is directly attributed to the Hela's FlexFoil mechanics. Enjoy. Does your product float in water? I have had an aerobie and the sink in water. @john, the hela doesn't float. 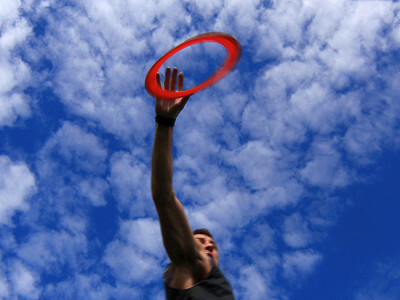 The only reason why a frisbee floats is because air gets caught under the rim. We are actually working on improving this for Version 2. Upgrade your game with Hela Disc, the first flying disc that changes shape during flight to fly faster and farther. The original flying discs were actually Frisbie Brand pie tins. College students found they could toss the tins long distances (which presumably encouraged more pie eating). Since then flying discs haven't seen much innovation. Cut to Bill Cowles and Will DiMotta, who engineered a disc that breaks the traditional mold. The Hela Disc uses FlexFoil technology, which lets the disc shift its shape and lift mid-flight. An oval with weight focused on the two ends, the disc’s natural centripetal force makes it compress and fly true, even in high winds.